Join us for a bit of lunch at Panera Bread Company in the Charleston Town Center Mall (Charleston, West Virginia) as we discuss our February read The Book That Matters Most by Ann Hood. Our group meets from 11:30 AM - 12:30 PM ET in the Community Room. Books are available at the Kanawha County Public Library - Main, just mention the mall book group. Ann Hood is the author of the bestselling novels THE RED THREAD, THE KNITTING CIRCLE and SOMEWHERE OFF THE COAST OF MAINE. Her memoir, COMFORT: A JOURNEY THROUGH GRIEF, in which she shares her personal story of losing her 5 year old daughter Grace in 2002, was a New York Times Editor's Choice and named one of the top 10 non-fiction books of 2008. She lives in Providence, Rhode Island. Ann Hood will be speaking at the Billerica Public Library on Thursday, April 16 at 7pm. Sunday, November 2 at 3pm - Ann Hood reads from "An Italian Wife"
Join us on Sunday, November 2 at 3pm, when Ann Hood reads from her most recent novel, An Italian Wife. 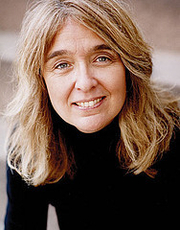 Ann Hood is the author of six works of fiction, including the bestseller The knitting circle and, most recently, The Obituary Writer, as well as a memoir, Comfort. She is also the editor of Knitting yarns: Writers on Knitting. The winner of two Pushcart prizes as well as Best American Food Writing, Best American Travel Writing, and Best American Spiritual Writing awards, she lives in Providence, Rhode Island. Why does knitting occupy a place in the hearts of so many writers? What is so magical and transformative about yarn and needles? How does knitting help us get through life-changing events and inspire joy? In Knitting Yarns: Writers on Knitting, Ann Hood has collected original essays by twenty-seven writers including Anita Shreve, Elizabeth Berg, Ann Patchett, Barbara Kingsolver and our beloved Martha Frankel, Executive Director of the Woodstock Writers Festival. Knitting Yarns tells stories about how knitting healed, challenged, or helped these writers grow. Andre Dubus III tells how knitting a Christmas gift for his blind aunt helped him knit an understanding with his girlfriend. Kaylie Jones finds the woman who cared for her as a child by using knitting to heal old wounds. Sue Grafton writes about her passion for knitting. And knitting goddess Helen Bingham has created five original patterns for the anthology. Poignant, funny, and moving, Knitting Yarns is sure to delight knitting enthusiasts and lovers of literature alike. Ann Hood is the author, most recently, of The Obituary Writer, as well as bestsellers The Red Thread and The Knitting Circle. She lives in Providence, Rhode Island. On the day John F. Kennedy is inaugurated, Claire, a young wife and mother obsessed with the glamour of Jackie, struggles over the decision of whether to stay in a secure marriage or to follow the man she loves. Decades earlier, in 1919, Vivien Lowe, an obituary writer, is searching for her lover who disappeared in the Great San Francisco Earthquake of 1906. The surprising connection between these two women will change Claire’s life in unexpected and extraordinary ways. Ann Hood is the best-selling author of The Red Thread, Comfort, and The knitting circle, among other works. She has been the recipient of a Best American Spiritual Writing Award, the Paul Bowles Prize for Short Fiction, and two Pushcart Prizes. She lives in Providence, Rhode Island. Marcia De Sanctis, Ann Hood, Abbie Kozolchyk, and Carol Reichert, contributors to The Best Women’s Travel Writing, Volume 8: True Stories from Around the World, discuss the latest volume in the travel writing series. From Travelers’ Tales comes The Best Women’s Travel Writing, Volume 8: True Stories from Around the World, edited by Lavinia Spalding—the eighth collection in the annual best-selling, award-winning series that invites readers to ride shotgun alongside intrepid female nomads as they travel the world to discover new places, people, and facets of themselves. The stories in this year’s edition are as diverse as the geographic locations, the common thread being fresh, compelling storytelling from a woman’s perspective aimed at making readers laugh, weep, wish they were there, or be glad they weren’t. Ann Hood's book Providence Noir was available from LibraryThing Early Reviewers. Ann Hood's book The Red Thread was available from LibraryThing Early Reviewers. Ann Hood is currently considered a "single author." If one or more works are by a distinct, homonymous authors, go ahead and split the author. Ann Hood is composed of 2 names. You can examine and separate out names.